On Mar 3 1806, Thomas Henshaw was recorded as Bondsman for the marriage bond of Hiram Lewis and Agness Cearney, Caswell County, North Carolina.7 It is unknown how this Hiram Lewis might have been related to Elizabeth Lewis, but she did have an uncle named Hiram Lewis. 1 male age 26-45 [Thomas]. 1 female age 26-45 [Elizabeth]. 2 females under age 10. 1 male age 50-60 [Thomas]. 1 female age 40-50 [Elizabeth]. 2 females age 10-15 [Eliza and ??]. 1 female age 5-10 [Elizabeth]. 1 female age 50-59 [Elizabeth]. 4 persons total in household. Elizabeth Henshaw, age 64, born in Person County; cannot read or write. Eliza Henshaw, age 30, born in Caswell County; cannot read or write. Elizabeth Henshaw, age 25, born in Caswell County. Malisia Henshaw, age 19, born in Caswell County. Eliza A. Warren, age 11, born in Caswell County. Margaret Warren, age 8, born in Caswell County. and James Terrell, in the possession of Doug Terrell. GEDCOM file B8791 at http://www.ancestry.com. Contribution from Charlie Weaver (). 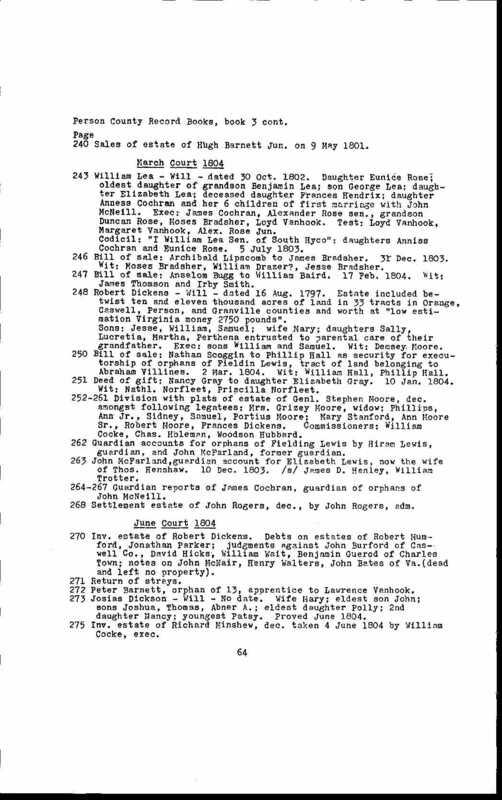 Person County, North Carolina Deed Books 1792-1825; http://www.ancestry.com. 1850 census, Yanceyville, Caswell County, North Carolina; roll M432-623, page 245A, line #5, dwelling #1082, family #1085. Person County, North Carolina Compilations, 1792-1823; http://www.ancestry.com. "North Carolina Marriage Bonds, 1741-1868"; Ancestry.com, 2000. 1810 census, Caswell County, North Carolina; roll 38, page 57 (482). 1820 census, Caswell County, North Carolina; roll M33-81, page 55. 1830 census, Caswell County, North Carolina; roll M19-119, page 271. 1840 census, Caswell County, North Carolina; roll 358, page 130.